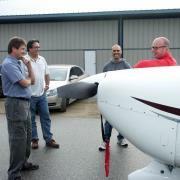 September's meeting was wrapped into a Hangar BBQ this year. In spite of our very best effort to host a Harvard Flight Event centred around a Hangar BBQ, the late summer weather would not cooperate. As the week unfolded everyone, pilot or not, looked to the sky and hoped that the forecast would show signs of improvement as the week progressed. Sadly by late in the week it was pretty obvious that this time the weather office nailed the forecast. Low cloud, gusty winds and persistent showers meant that Bjarni, from the Canadian Harvard Aircraft Association, was not going to make it. We're happy to say that even though the weather gremlins kept us ground-bound they couldn't foil our BBQ. Come 5:00 PM our President Chris Thompson ignited the grill and we had a wonderful evening of friendly conversation, hangar flying and reminiscing. As a COPA Flight, it's always a pleasure to invite guests to our functions. This month we saw one former member, George Horwood, and his guest Raule attend, along with ECAF member Larry Quinton and club friend and fellow pilot Ashylnne Dale also joined us for the evening. Thanks to all who could make it. Click here to enjoy a few photos.